Just as with Rome, there are many roads that lead to Bath. From London you can easily get there by train, bus or en route during a guided coach tour. On my first visit, me and my mum stopped over for a few hours during our "England in one day" tour with Premium Tours. When I visited with my American relatives on our little English countryside road trip, we stopped here with our rental car and on my third visit in July, I hopped on the National Express bus for £13.50 return. No visit to Bath would be complete without seeing the ruins of the spectacular bathing temple set up by the Roman founders of the city around AD 43. If you only do one thing, do this! The entrance price might seem a bit steep, but it's absolutely worth it! First of all, for a history buff like myself it’s amazing to see how something so old can still be so well preserved. Second of all, the museum would only be half as interesting if it hadn’t been designed in a way that makes it the most exciting interactive experience (by the way, a very child‐friendly one, too). The audio guides provide the visitor with tons of well researched background stories about the city that was once called Aquae Sulis and the daily life of the people that lived here. These people are impersonated by real actors running around the Baths as well as actors in films projected onto the wall. 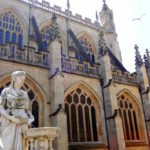 A great way to save is a combo ticket, which includes both the admission ticket to the Roman Baths plus a guided walking tour through the city. Catching up with the Romans! If all that sightseeing has made you tired, what better treat is there than to indulge in a spa session yourself? Luckily, you don’t have to walk far. A few steps from the Roman Baths, you will find the modern version of the antique well‐being temple: The Bath Thermae Spa. I really wanted to try this out, so on my visit in July I booked the Thermae Treat spa package, which costs less than £100. With this package I got 4 hours in the spa, my own towel, robe and slippers, a Reviver Back Massage and a Head & Food Massage. I thought this was great value for money. Orientation‐wise, I found the spa a little confusing in the beginning. For obvious reasons in such an old city like Bath, it was build in a style focusing on height rather than width, so be prepared to walk up and a down the stairs a few times. The great advantage is of course the open‐air rooftop pool, which offers great views over the city and up into the dramatic sky. What I also liked a lot were the steam rooms with four gorgeous scent mixtures and an amazing rainfall shower! Probably a bit underrated because less known and located outside of the main town centre, this museum is a hidden gem! When I was there, it was easy to get to because there was a free hourly shuttle bus service from the bus stop in central Bath just behind the abbey. Make sure you check the website though, as the shuttle bus is not always available. Also, the museum is only open during the season between March and November. The museum itself was worth the small journey because once you are there, you get to undergo a journey through all centuries of America history – accompanied by an amazing audio guide and enthusiastic staff in almost every room. Who would have thought that you can see so much of the USA while still standing on British soil? A must‐see for anyone interested in how people dressed over the centuries. My visit started off with an exhibition about the suffrage movement as seen in the film Suffragette (2015). Then there was a section about how people dressed during World War I and one that featured costumes from various films and TV series such as Doctor Zhivago (1965) or Downtown Abbey (2010). A great highlight for every inner child was the dressing up area! Where else can you get a picture of yourself in Victorian dress? 🙂 It was free, too as you can take the picture with your own camera. At the end of the permanent exhibition is a display of all the "Dresses of the year". I thought the line‐up of the "Dresses of the year" from 2000, 1969 and 1985 was quite amusing as they so quintessentially represent their era. Who doesn't remember Jennifer Lopez' Versace dress with a cleavage that went down all the way to her belly button? It was THE dress everyone talked about for much of the year 2000. Bath's world‐famous flats for the rich and famous – Royal Crescent and the Circus – teach you a lot about how the city looked like in the glorious Georgian times. No. 1 has been completely restored as to how the house would have looked like between 1776 and 1796. I thoroughly enjoyed strolling through the house, which is now a museum with friendly commentators in every room. Because of its wealth of Georgian style houses, Bath is the perfect place to shoot films that are set in a time period from the 18th to early 20th century. For example, a scene from Les Misérables (2012) was filmed around Bath’s iconic Pulteney Bridge. Other big name productions shot on location in Bath include Vanity Fair (2004), The Other Boleyn Girl (2008), and The Duchess (2008). I also briefly visited the Holborne Museum – a rich gem for every fine art lover as it is full of lovely Georgian paintings. Of course, depending on your interests, there is so much more to do in Bath. The Jane Austen Centre is, for example, a must‐do for every fan of this famous English writer. The cheapest options in Bath are the centrally located hostels Bath Backpackers Hostel and St Christopher's Inn Bath. If you're looking for medium‐priced double or single rooms in a typical Georgian townhouse, check out Marisha's Guest House. A little bit outside the city centre, I can recommend the Rainbow Wood Farm – a privately owned, very small and cosy Bed&Breakfast farm that my American relatives discovered. The farmhouse is very old, the rooms comfy and the full English "breakie" yummy. The friendly hosts may also give you a tour to meet the many animal residents of the farm including chicken, piglets, dogs and cows. 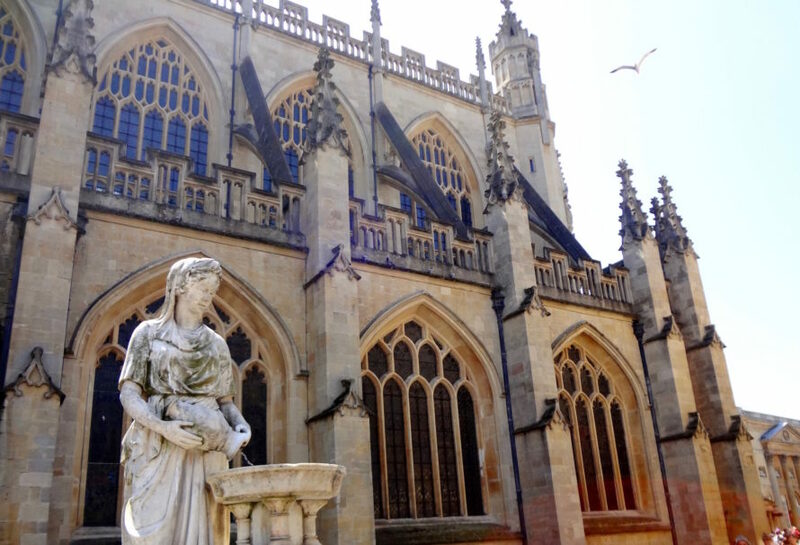 Would you like to visit Bath yourself or have you visited before? Share your questions or tips with me in the comment section below! Disclosure: This blog post includes affiliates link to booking.com and GetYourGuide.com. If you click on one of these links and make a booking, I will receive a small affiliate fee, which I will use for the costs of running my website.